This is a guest post by Jenny Rosenstrach, blogger and NYT best selling author. As the author of my brand new book called How to Celebrate Everything, you can imagine the questions people regularly ask me. Things like “My daughter’s turning one, what should I do for her first party?” or “I’m throwing a bridal shower for my best friend. What should I serve?” or “Help! 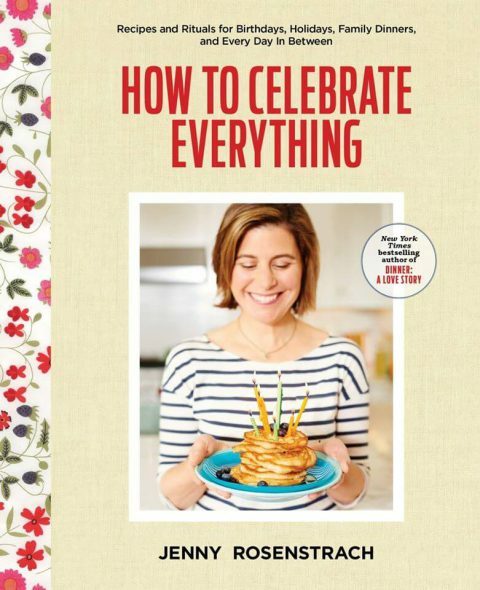 I signed up for the Bake Sale and it’s tomorrow, and I don’t know what to make?” Naturally, the book addresses solutions and recipes for these kinds of typical parties (start with the Mud Cake, oh my goodness!) but the heart of the book lies in finding meaning and celebration in the everyday. In family rituals. 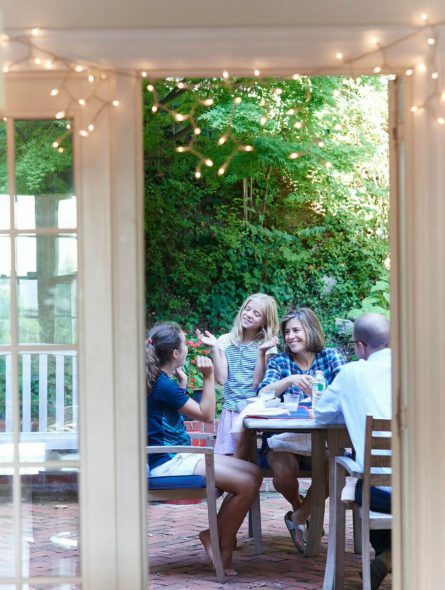 Here are four reasons why I think celebrating those smaller family rituals are every bit as important as celebrating the big ones. Rituals infuse meaning into every single day. If you’re like me, it’s easy to feel like you’re trapped inside a giant video game. You’re just trying to make it to the finish line without letting flying obstacles – work, tantrumming toddlers, extracurricular overload, in-laws, fill-in-the-blank – derail you and your family. I always think of my friend Jodi who once asked me “Do you ever feel like these are our practice kids and that the real ones are going to come along when we’ve finally figured out what we’re doing?” It made me laugh, but it also made me realize something: This is it. This is their childhood. What am I doing, as their mother, to infuse meaning into their lives? What are my daughters holding on to? What am I holding on to? I don’t pretend to have the answer, but I’ve stumbled on a strategy that makes me feel better until I do: Celebrate everything. Turn things into rituals. No matter how small they are, I find family rituals bring comfort and connection; they make you stop and pay attention to what is happening in front of you. If you are scratching your head right now wondering if you have any family rituals, let me assure you: you do. I’ll bet you probably stop at the same restaurant on your annual road trip to the grandparents’ house. Or have ice cream in the same shop after every soccer game? Or make homemade pizza every Friday night? (Or even takeout pizza every Friday night? That counts, too, but don’t tell Lisa!) When you put your rituals goggles on, it’s like logging onto Pokemon Go. Little opportunities are floating all around you – but until you make a point to notice, to live more intentionally, you won’t know to take advantage. Rituals are good parenting on autopilot. When you are a parent, there are so many niggling details to deal with every single day – book doctor appointments, sign permission slips, make school lunches, unpack uneaten school lunches, rsvp to parties, buy shoes (is it just me, or does it feel like this is a daily activity?) I’ll stop before you break into a panic. My thinking is this: Since there are so many little things to remember, isn’t it nice to know that some of the big things — namely sitting down to regular family meals, making the same breakfast every birthday, dancing after dinner — are on autopilot? That’s the power of family rituals. Sure they connect you to something larger and more meaningful, but any parent can appreciate that they also save you precious time and precious (slowly decaying) brain cells. Food rituals help meld memories with happiness. Now, of course there are all sorts of rituals that don’t involve food, but for our purposes here today on this website, I just want to say that we’d all be crazy not to use food to our advantage in the memory-making department. Think about that food that instantly beams you back to your childhood kitchen or to the beach with your friends or Christmas dinner with your grandfather, aunts and uncles. Food has the power to call up happiness in a way that very little else can. Why wouldn’t we exploit it? It’s the very definition of a win-win: We fossilize the memories and we eat very very well while doing so. On the other hand, rituals don’t have to be accompanied by five-course meals or major extravaganzas to be meaningful. This is the real message. Of course, rituals associated with big, huge, once-a-year holidays are important, and my book goes into great detail about our family’s traditions (food and otherwise) on The Fourth of July, Thanksgiving, Christmas and all the other biggies. But again, it’s more about finding everyday rituals, rituals that are special because they are so personal and unique to your family. 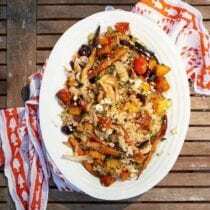 For instance, every Saturday morning, soccer schedule permitting, we walk to the farmer’s market to gather ingredients for favorite dishes: a tomato sandwich in the summer; a brown butter apple pie in the fall; a quinoa salad that takes advantage of whatever vegetables are in season (see our recipe below). And also cider doughnuts. We gather lots of cider doughnuts. My daughters love this ritual and look forward to it every week. So do we, especially because it couldn’t be more simple to execute. The point? Rituals don’t have to be huge, they don’t have to be perfect. They just have to be yours. Preheat the oven to 400°F. Line a roasting pan with foil. In the prepared pan, toss the carrots and fennel with 2 tablespoons of the olive oil, the coriander, and salt and pepper. Place in the oven along with the foil-wrapped beets, and roast until the carrots are tender, golden, and lacquered but not burned, and the fennel is tender, about 30 minutes. Keep the beets in for another 20 to 30 minutes, or until a knife easily slips through one. Allow to cool, then peel and quarter. Meanwhile, in a medium skillet cook the onion in the remaining 2 tablespoons olive oil over low heat until caramelized and brown (but not burned), about 25 minutes. While it cooks, bring 2 cups water to a boil in a medium pot. Add the quinoa, stir, and cover with a tight-fitting lid. Reduce the heat and cook for 13 to 15 minutes, until all of the water has been absorbed. Fluff with a fork and remove to a bowl. Toss in the butter right away. Let cool. 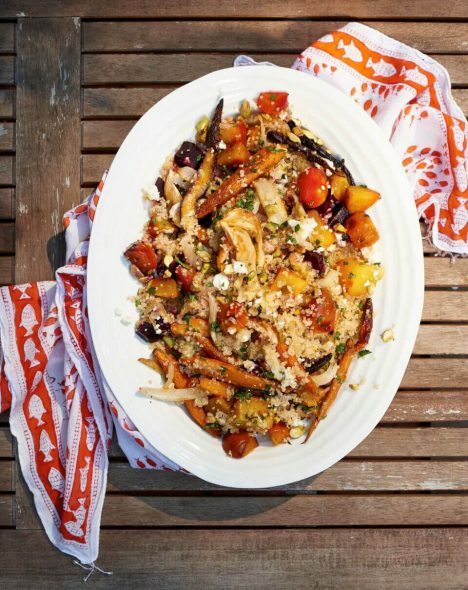 In a large bowl, toss the quinoa, carrots, beets, fennel, onion, feta, pepitas, and vinaigrette. Top with the herbs and season with salt and pepper. Add the mustard, vinegar, shallot, lemon juice, honey, and salt and pepper to a small jar and shake vigorously. (Or whisk together in a small bowl.) Add the olive oil and shake or whisk again until emulsified. * Can be tree nut/peanut free if pistachios are omitted. 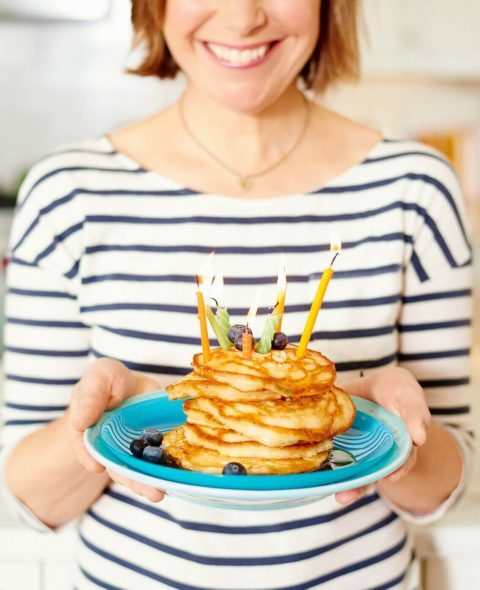 Previous Post: « What’s in my new Fast & Fabulous cookbook – released Oct 25th! What a wonderfully thoughtful post. It’s so true that those memories of “we always did X when we were kids” get more and more golden with passing years. I usually make quinoa salad with raw vegetables, but roasting sounds like a way to make it all new! I loved Dinner: a love story! Excited to read your new one. Sometimes, I do feel like each day is just a race to get everything done before bedtime (mine, ha ha!). In preparing for my son’s 2nd birthday, I first had the realization– this is his childhood. Like you said, this is it. I realized I wanted to be a bit more intentional with how we spend our time. Your post is a great reminder! We always make mini-chocolate chip pancakes for breakfast on Saturday! I love how it’s brought us together and the smiles it brings. I would like for you to consider using a darker font on your blog. The grey is very difficult to read..